Well, we made it folks... We survived until the weekend! I don't know when I've been quite so ready for the weekend's arrival! You know they say that when it rains, it pours. Well, this week tried to get the very best of our family. But we do have one bit of happy news (yes, this is the news I have been hinting at). The most exciting news it that we are moving!! And soon. In less than a week! I will share some more details and pictures very soon. But for now, it is a flurry of boxes and packing in our house! For now, I wanted to share a springy project! I actually shared this at Sew Dang Cute last year. ( Yes, last year! I must be a blogging delinquent for just now re-posting this!) I will have a huge, lovely garden at our new home. 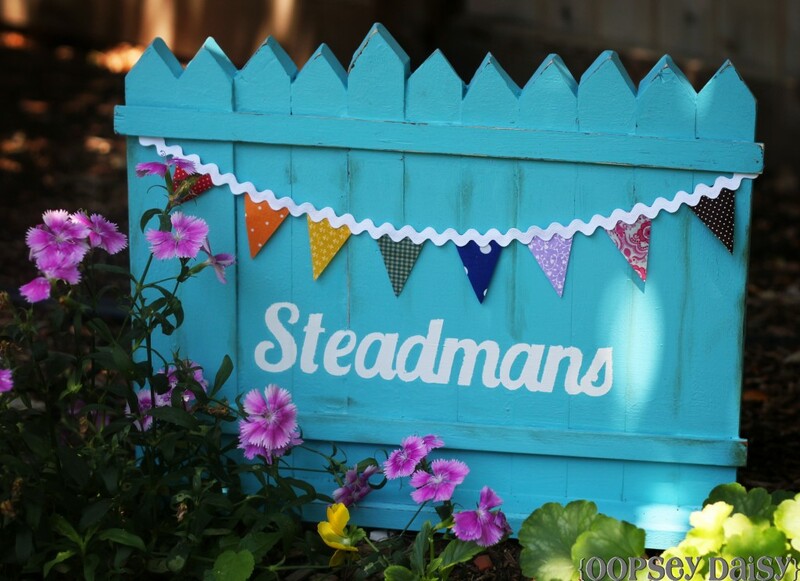 So this cheery picket fence will have a permanent home very soon! Or maybe I will keep it in my craft room? So many options here. I started out by purchasing an entire plank of wood from Home Depot. The wood was 1.5 inches wide and 0.75 inches thick. 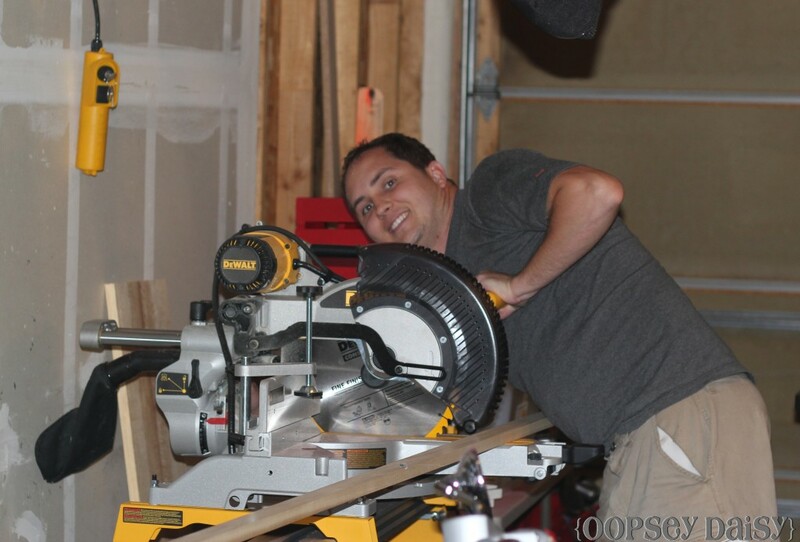 I put my handsome hubby to work cutting the wood with his table saw. We had enough wood to cut 11 pieces of wood. Each piece of wood was 12 inches long. 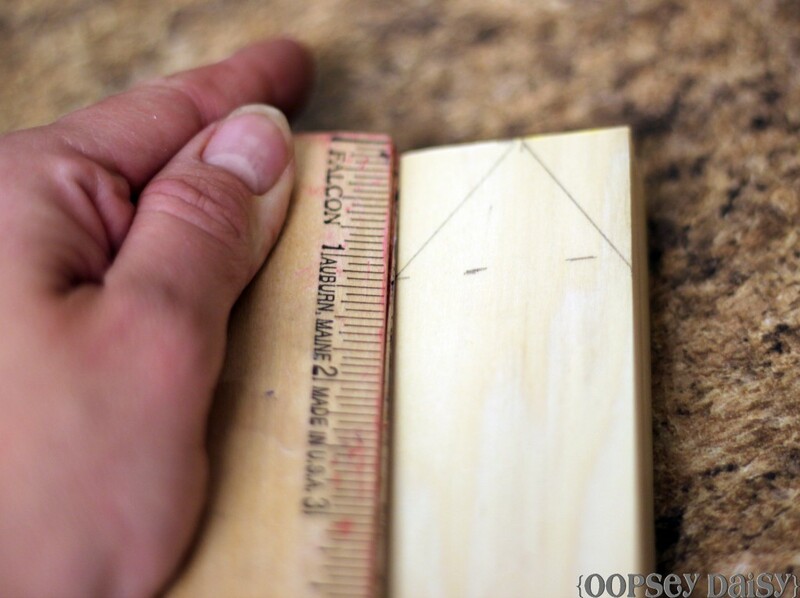 Very carefully, I glued each of the wood planks together using gorilla glue. 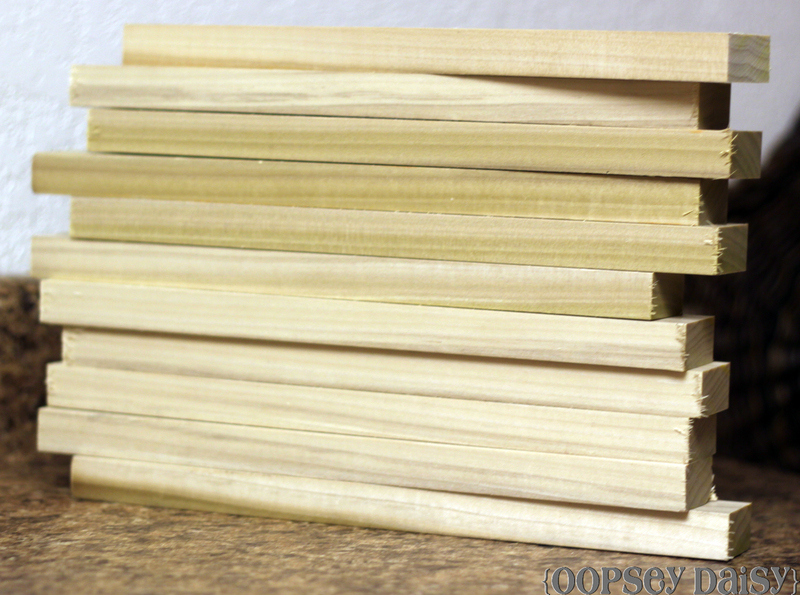 Once those were dried, I glued them all to a 2x4 base. 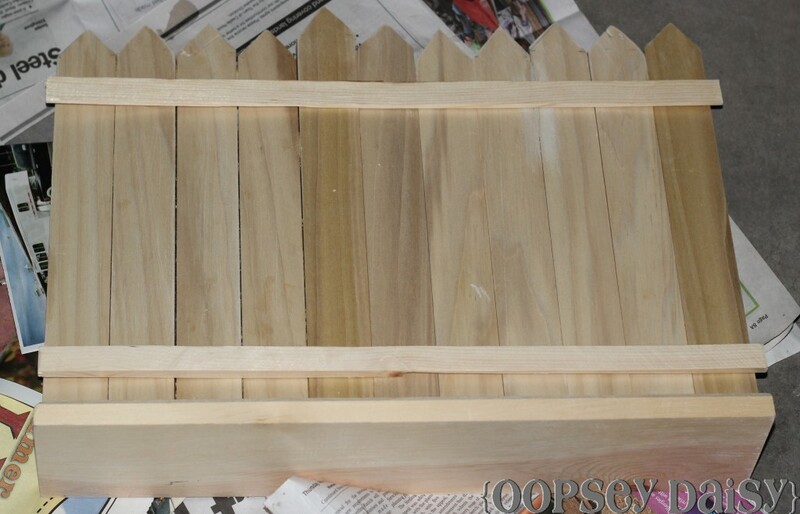 We used a few pieces of scrap wood as cross pieces to glue on the top and bottom. I let the entire fence set for a good 24 hours. First, I spray-painted the fence brown. I wanted to be able to sand off a layer of paint to make it look distressed. Then I topped the fence with a lovely coat of turquoise paint... This color is my new obsession! Finally, I used my Cricut to cut out a stencil out of contact paper. I carefully painted over it with white paint. Wouldn't it be fun to paint a sweet quote here? Once the paint was dry,I sanded it up just a bit PLUS added a bit of distressing ink. I love the distressed look! 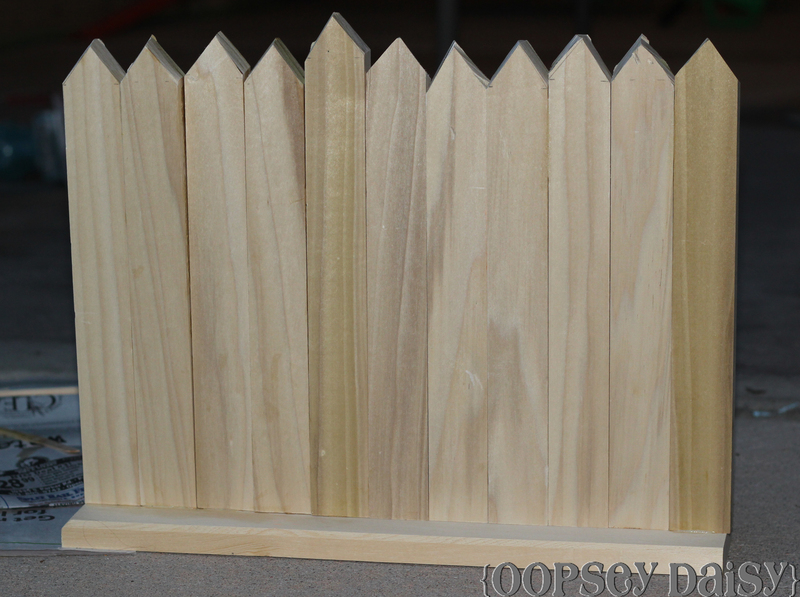 With a coat of sealant spray, the picket fence is ready for the outdoors! Until I get my REAL picket fence, I am very happy with this one! It just makes me happy. P.S. 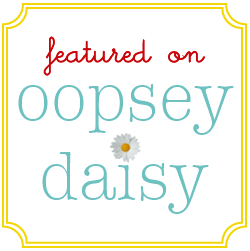 Today you can find me over at The Scrap Shoppe today featuring a fun Pinterest find! Have you linked up to Pinterest Master List yet?? Oh! This is SO cute! What a sweet idea! I’m lovin’ that turquoise color too! Nice Job! this is perfectly adorable! i have been collecting ideas to make a ‘welcome’ or ‘williams’ sign & this is going into the file!! love it! & good luck with the move – wish i could help! 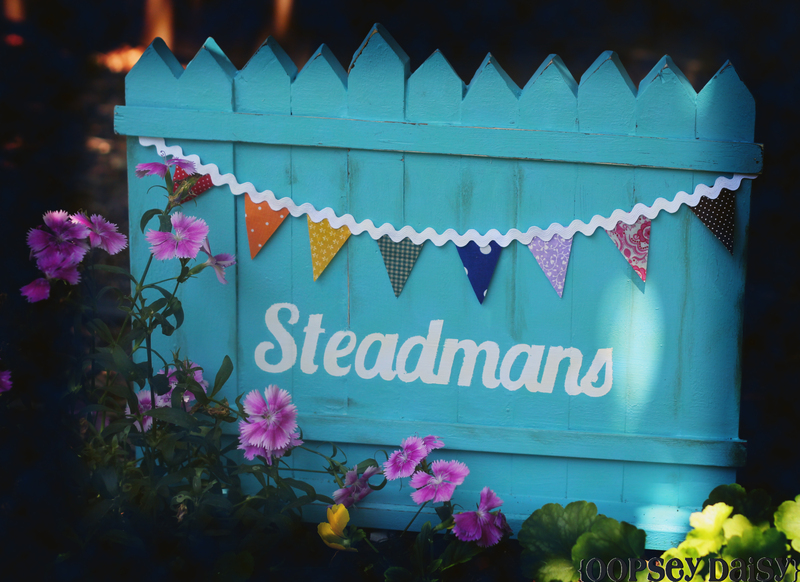 Ive always wanted the white picket fence too, and still haven’t gotten one. This is lovely!!! I love the color, my latest obsession as well. It looks so sweet and the bunting is great! I love that you left it loose for different holidays and seasons. Thanks so much for sharing. 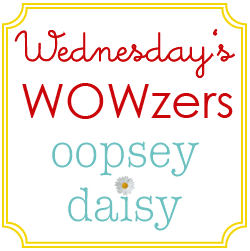 Lynn @ Scrapity Anne recently posted..Giveaway Winner! Cute cute! I’ve also always wanted the white picket fence! Great idea! 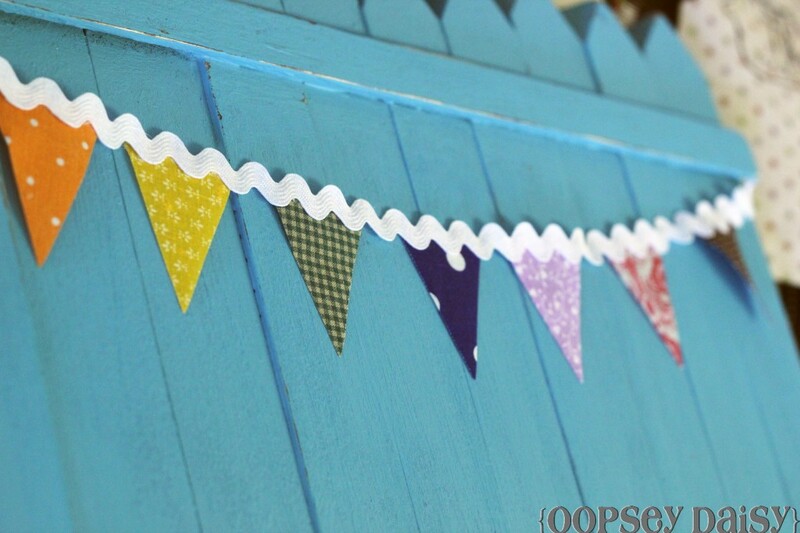 You can use outdoor mod podge on the pennants to make it durable for the elements! okay that is just way to cute!! LOVE this! I want one in my yard!! Thanks for sharing. Good luck with your move!! So cute Alison! 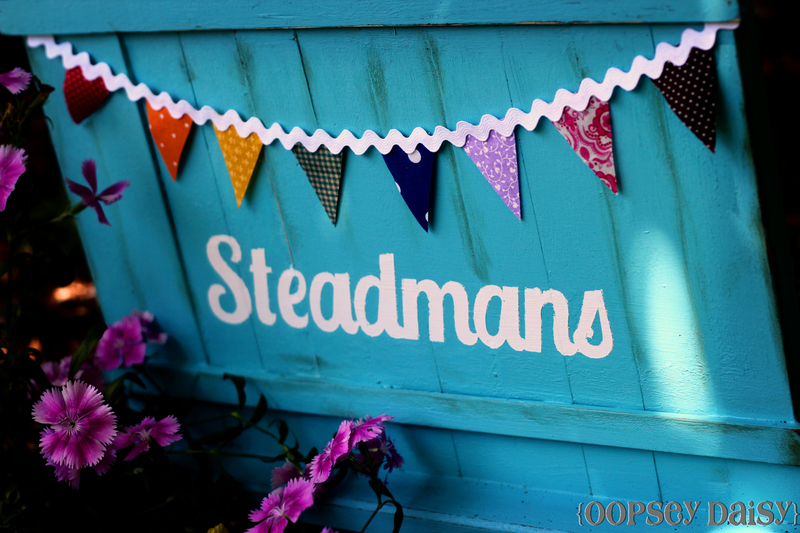 Love the cute pennant banner you made too! LOVE the color!! You out done yourself again. This is down right the cutest thing I’ve seen. Thanks for the post. Your picket fence is so cute! Love the color. 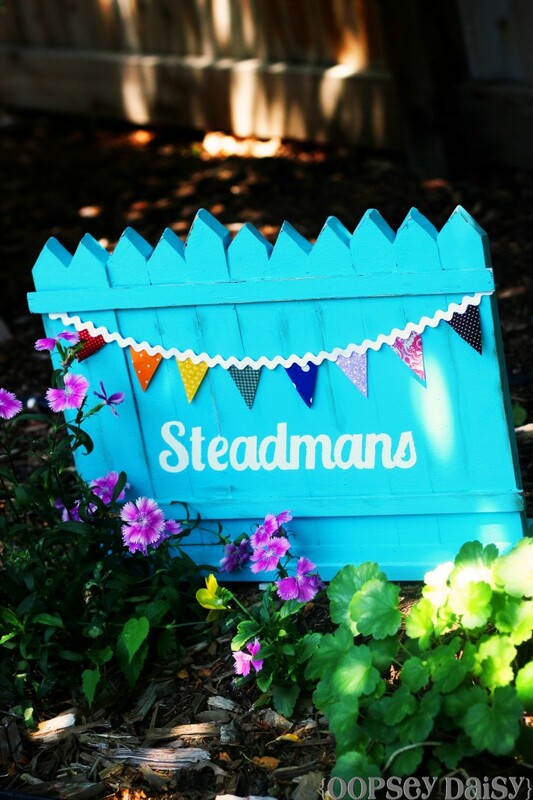 I may have to make my own…I’m STILL waiting for my white picket fence for our house too! Congrats on your new home! That’s really cute Alison. 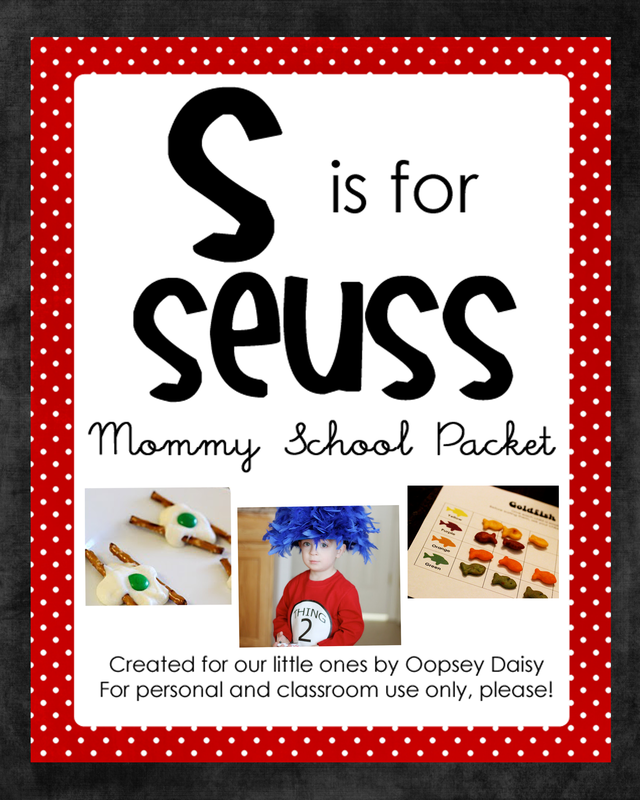 I am itching to make one now too! Ha! I’ve been begging for a picket fence too and this would be as close as I get until the babies get older, I’m sure! I always love your inspiration! 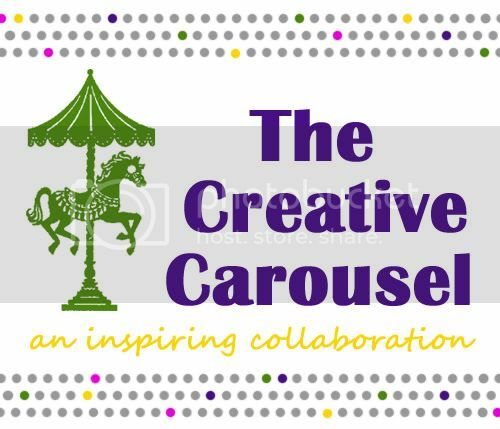 If you have a minute it would be awesome if you could link up at my Destination: Inspiration party going on now at Teagan’s Travels! This is just downright adorable, Alison! Love it! seriously, that is stinking cute! 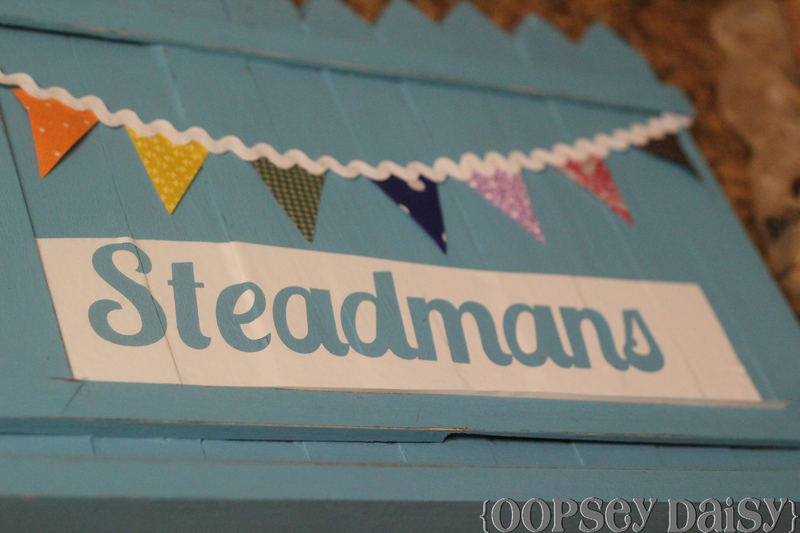 i love the bright turquoise and the bunting, that is a great idea. congrats on your move! Soooooooooooooo cute!!!!! I absolutely love this idea. Very nice!!! Now I wish I was crafty enough to try this!!! this is really cute! We might be making one of these in our near future:) Thanks for sharing! Hi, I was just wondering how it stands up? I saw that you glued it to a 2 x 4 base. Is there any other trick to keeping it upright? Thanks! My spouse and I stumbled over here coming from a different website and thought I may as well check things out. I like what I see so now i’m following you. Look forward to finding out about your web page repeatedly.